Have you got questions about netball posts? You’ve come to the right place! Grand Slam has over 30 years experience providing netball equipment to schools, councils, sports clubs and residential properties. We’ve supplied sports equipment for countless high profile events and facilities, including the Sydney Olympics, Melbourne Commonwealth Games, South Pacific Games (Fiji), Waitekere Sports Complex (NZ), and Suncorp Stadium. All our sports equipment is engineered for strength and reliability and is designed and built to meet the most rigorous safety and quality standards. We have put together this handy guide with commonly asked questions to help you decide what you need when purchasing netball goals. What specifications do my netball rings and posts needs to be? However, the specifications vary depending on the age of your netball players. This is where an adjustable netball goal post comes in handy. A goal post with an adjustable ring is essential if you plan on organizing groups of adults and/or children of different ages, not all of whom may be able to cope with a 3-metre tall ring. 305 cm for adults and professional players. What’s the difference between indoor and outdoor netball posts? The main consideration when it comes to outdoor netball goals is that they need to withstand the weather. 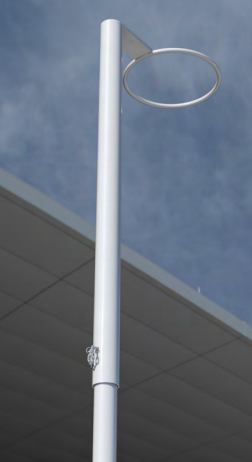 For permanent installations, 76mm diameter poles provide rigidity and are robust for outdoor use. It’s very important that your sports equipment meets minimum manufacturing requirements – particularly if you are supplying to schools. For example, Education Queensland has strict specifications for sports equipment. Before purchasing your sports equipment, it pays to double check they meet legal manufacturing requirements. Otherwise, you could unfortunately be liable for any issues that may arise. Additionally, a lot of suppliers do not hot dip galvanise prior to powder coating, meaning they are not adequately protected from corrosion (and safety issues that could arise from this). So insist on high quality protection when purchasing your sports equipment to save yourself hassle down the track. Grand Slam’s netball equipment is thoroughly reviewed and tested to ensure it exceeds safety requirements. All our sports equipment is engineered for strength and reliability and is designed and built to meet the most rigorous safety and quality standards. Indoor netball posts are designed to be robust, however it is kept in mind that they are often installed on multi-purpose courts. This means there is often a need for them to be removed to make room for other sports equipment. This means they need to be lighter and more manageable to put into storage regularly. How do the netball posts attach to the ground? To attach netball posts to the ground, the most common and widely used method for outdoor goal posts is the sleeve system – allowing the posts to be inserted into sleeves that are then concreted into the ground, so the post can simply be pulled out whenever you need to pack it up and go. As an added safety feature, caps can also be placed over the holes. Indoor netball goals require a different lock-down technique, depending on whether the netball court is timber or concrete. Posts are set in place using a sleeve that is concreted in place under the floor, and they are locked in place using a floor plate. Click here to learn more about floor attachments for your netball goals. Do I need netball post padding? It is highly recommended to install post padding on your rugby posts for obvious safety reasons. In fact, most schools, clubs and councils are obliged by law to cover all exposed sports equipment with padding to protect players. For private residential netball goals, shorter post padding is acceptable. 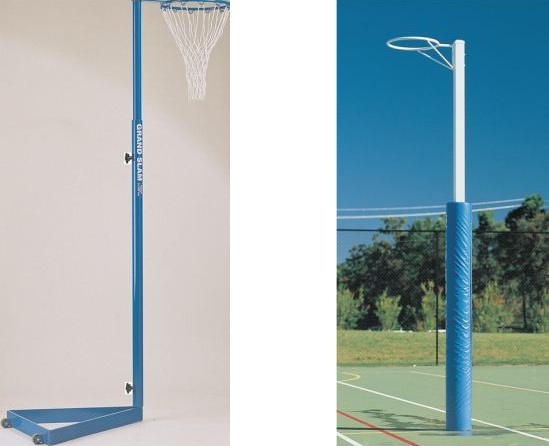 Click here to learn more about netball post padding. All these details are essential when it comes to following the most important regulations and guidelines for netball equipment and ensuring a safe and professional game of netball. We hope you found this netball goal guide useful. Stay tuned for more handy netball equipment tips and info coming your way!